The clean and immaculate place doesn’t always mean hours of scrubbing. 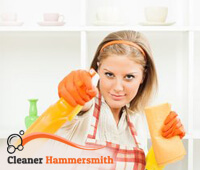 Our cleaning services will provide you with unbeatable cleanliness while you can enjoy your free time. 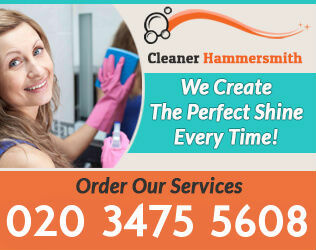 We take pride of all the positive feedbacks from our customers in Hammersmith and we would like to provide more people with the great experience of having a clean and cosy atmosphere, without burning their wallets. 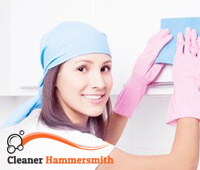 Our cleaning technicians are always available and ready to meet your requirements. They will show up just on the dot and will plan the cleaning, so that no spot will be missed and no minute will be wasted. We are dedicated to our job and we do it with passion. The art of turning the mess into immaculate cleanliness and order is our goal. Our cleaning teams are professionally-trained to perform both residential and commercial cleaning. Supplied with all the latest technologies and with vast knowledge of cleaning, we promise that we deliver only the top quality for all of our customers in W6. Our cleaning technicians always make sure that the customers are delighted with the results. If something doesn’t fit to your taste, just let us know, and we will comply with your demands. Our driving policy is honesty, hard-work and quality. With us you won’t receive any hidden taxes or charges. Our prices are fair, in accordance to the size of the place. Our office is based in Hammersmith, W6, but you also give us a call and our friendly representatives will provide you with all the necessary information. The technologies used by them are of the highest quality on the market, so that no trail of dirt will be left. For your own safety as a customer, we understand that to let somebody in your place may disturb you and we want to assure you that all of our staff are insured, vetted and proven people.